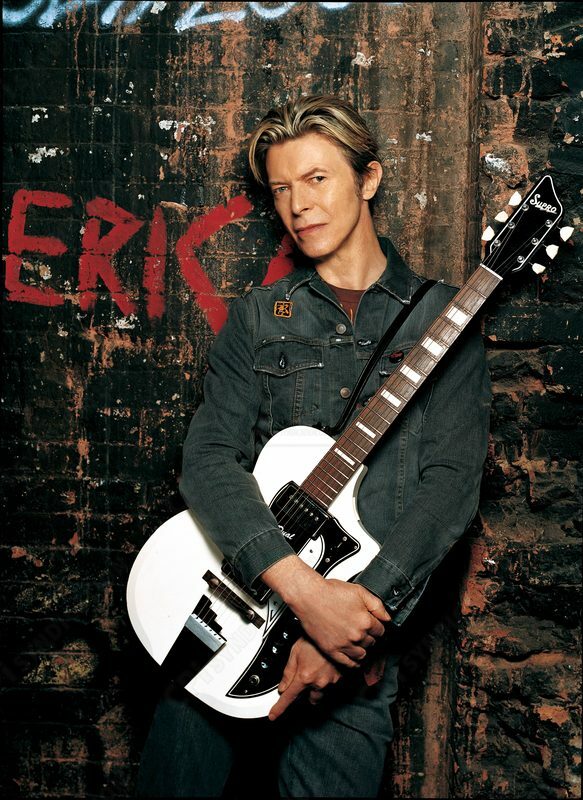 Be a "Starman" with the latest David Bowie Supro now with a hardtail. Get yours now at Chicago Music Exchange. Visit our showroom at 3316 N Lincoln Ave in Chicago. Or call us at 1-773-525-7773. WHOOPS! Sam said HUMBUCKER, those aren't HUMBUCKERS, they are Supro Vistatone pickups! During the recording of the Reality album in New York City in early 2003, Bowie purchased two early-60’s Supro Dual Tone guitars on EBay. One of them, which is prominently featured on the cover art of the New Killer Star single, was a 1961 hardtail model. Developed by Supro with assistance from the David Bowie Archive, the David Bowie 1961 Dual Tone is based on the hard tail David Bowie played on the Reality album and throughout his final world tour, “A Reality Tour”, in 2003-2004. 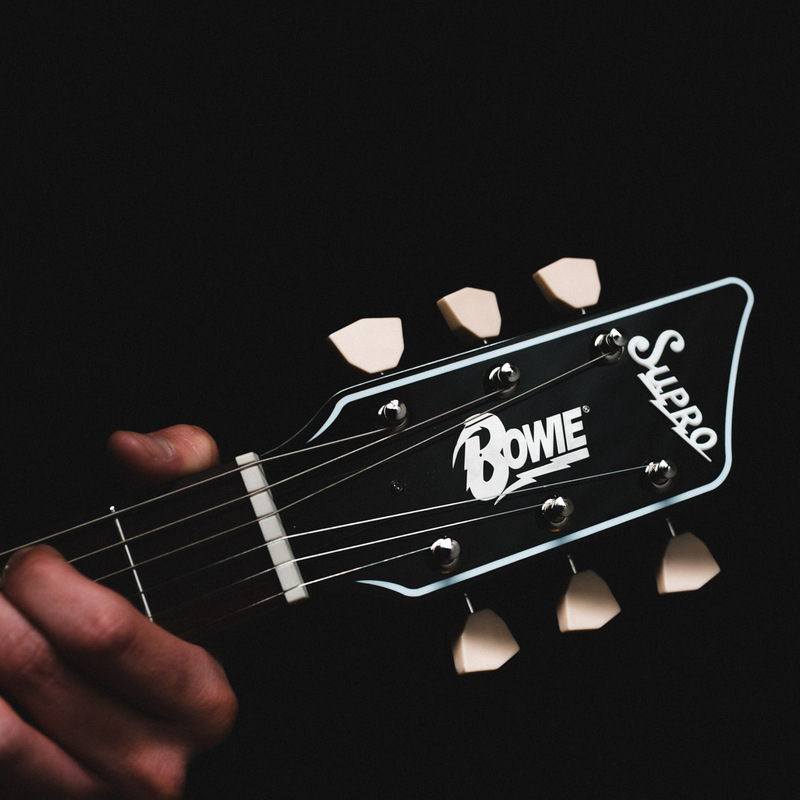 Although he played a variety of guitars throughout his career, Bowie enjoyed a special relationship with the iconic vintage 61 Supro Dual Tone. 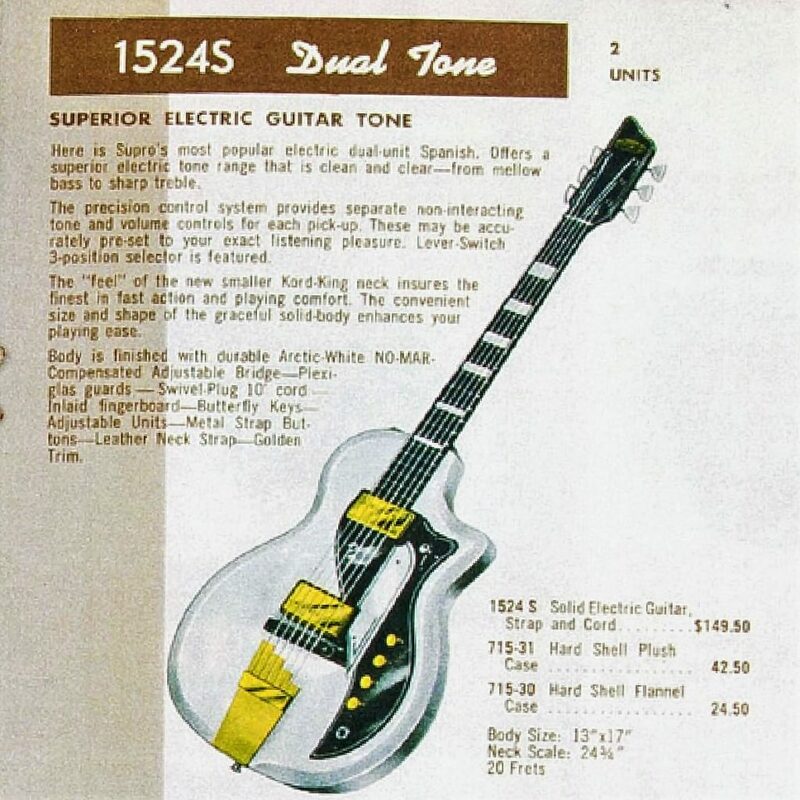 The Dual Tone model first appeared in Supro catalogs in the early 1950s. The distinctive tone of the Supro Vistatone pickups has been a consistent highlight of this instrument throughout its evolution. The 1953 Supro catalog boasted: “We sincerely believe the pickup system to be the finest we have ever produced in over two decades of electronic development. Make an honest comparison with any instrument for tone, volume, and performance—you’ll be truly surprised. “Over the subsequent five years after ’53, the neck was improved, headstock changed, body widened, pickup wiring changed, and contoured bevels added to the body. By 1958, the Dual Tone was totally dialed in, and became a bestseller for Supro. 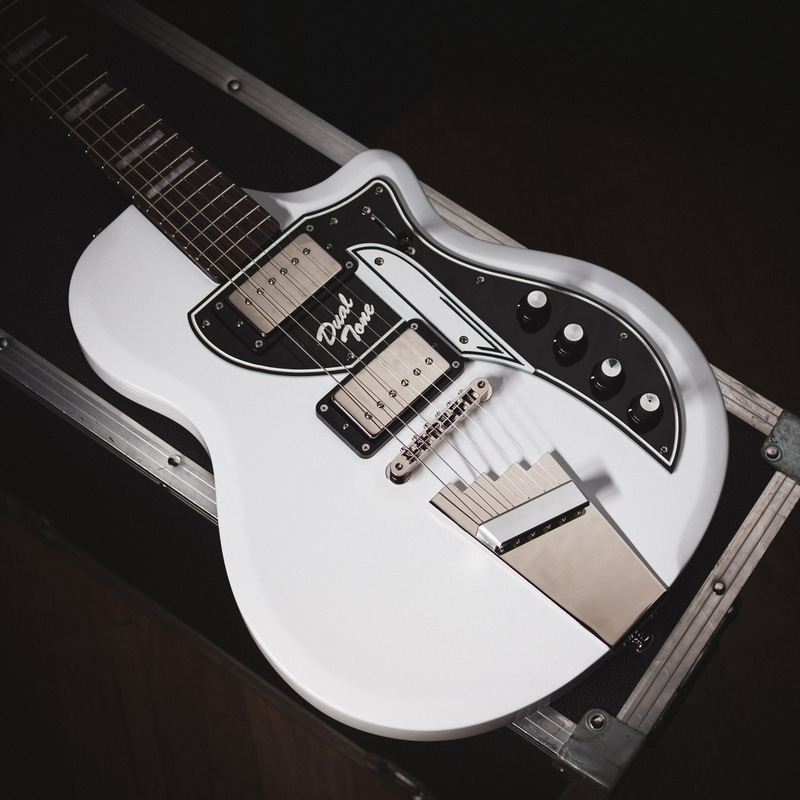 In keeping with the spirit of innovation that evolved the 1953 Dual Tone into the 1961 model favored by David Bowie, the construction of the David Bowie 1961 Dual Tone guitar has been further developed with subtle tweaks and refinements to carry the torch into the present day—while retaining the vibe of the original instrument. This incarnation of the Dual Tone guitar features a 24 ¾” scale maple neck with a Pau Ferro fretboard and set-neck construction. The mahogany body has a tummy cut for increased playing comfort, as well as an ergonomic neck joint, allowing full access to the high frets. Hardware appointments include reverse stairstep tailpiece, tune-o-matic bridge, butterfly tulip tuning pegs and a matched set of vintage-correct Vistatone pickups, designed to replicate the genuine Supro sound that David Bowie loved. 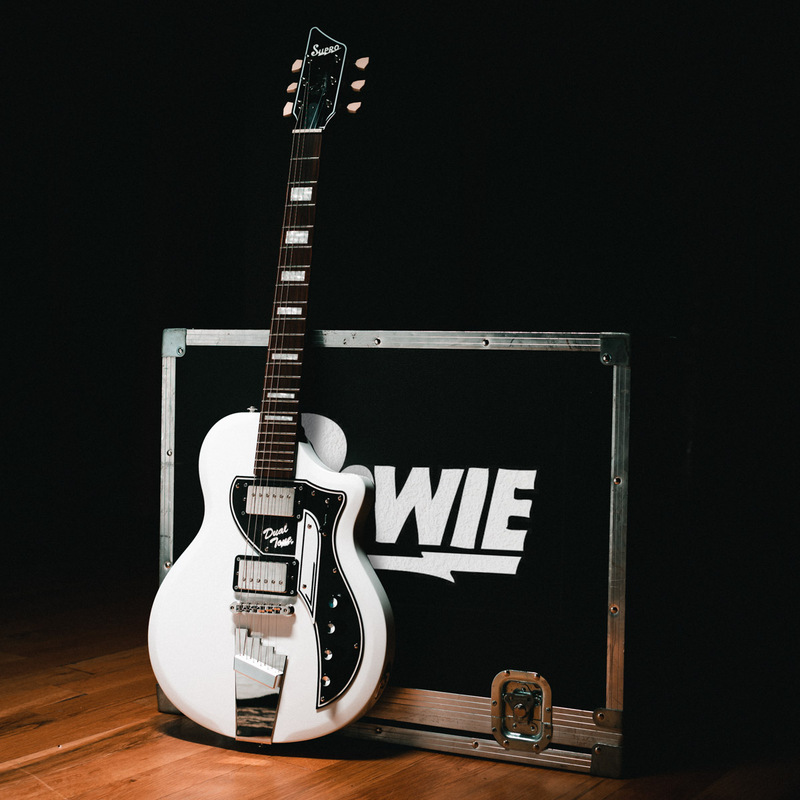 As a final touch, the David Bowie Limited Edition Dual Tone features a mirror-finish Bowie lightning bolt insignia on the face of the headstock.